The first season finale of The Good Place offered an all-time great twist, the sort of narrative-upending yet logically satisfying reveal that TV so often aspires to, but so rarely pulls off in its sloppy, it-was-all-a-dream idleness. It was so good that even its cast didn’t see it coming, as documented in Kristen Bell’s backstage video, nor—and this is key—did anyone suspect there was a mystery to even be revealed. 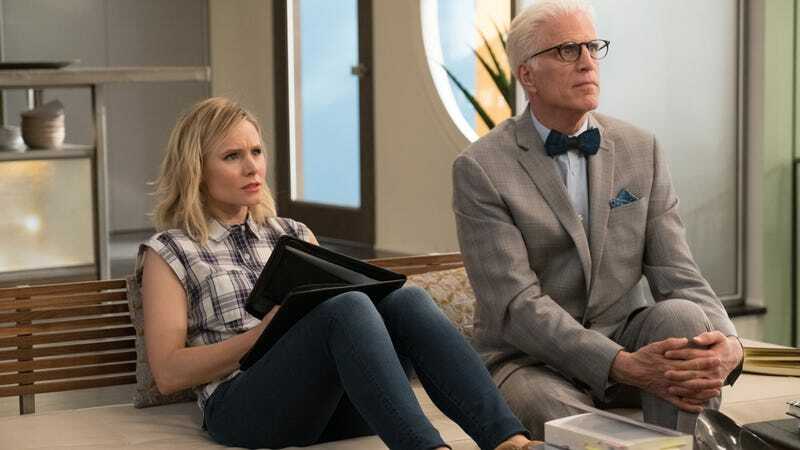 With one, similarly all-time great ghoulish chuckle from Ted Danson’s Michael, The Good Place imploded its entire dynamic, and it exposed just how much blind faith the television audience places in what it’s told. As part of the show’s existential riffing on the absurdity of the afterlife, it was perfect: How can you trust that there is any benevolence or order to the universe? And as a storytelling device, it was both ingenious and insane, daring to rewrite all the show’s relationships and our relations to them with a reshuffling that has continued reverberating throughout its stellar second season. But it also created a sense of mistrust that The Good Place, quite possibly, can never get back. As Michael has forged his fragile alliance with “Team Cockroach” this year, seemingly resigned to joining, rather than beating them, Eleanor (Bell), Chidi (William Jackson Harper), Tahani (Jameela Jamil), and Jason (Manny Jacinto) have all been understandably skeptical of their tormentor’s sincerity. Their asking why they should trust him now after such a huge deception is, not coincidentally, not unlike the viewer asking how they can trust anything about the show ever again. After all, The Good Place is itself a hermetic universe lorded over by another Michael, creator Michael Schur, who has demonstrated his own devilish zeal for just straight-up messing with people. And once you’ve established that the entire framework can just be wiped away in an instant with one oily laugh, the viewer—like Eleanor, et al.—is naturally, constantly on guard for it to happen again. Creatively, of course, it’s been great for the show. In addition to catapulting this already-innovative show to one of the medium’s most unpredictable, shredding the rulebook has allowed The Good Place to push the boundaries of narrative logic in pursuit of a silly joke in ways other TV comedy writers must envy—and that’s saying a lot for a show whose premiere featured giant, flying shrimp. Yet somehow this limitless potential for absurdity hasn’t overwhelmed its core foundation of largely character-based humor, which has retained that grounded, human dynamic that Schur’s shows do so well. Even during its most ludicrous detours, it’s been able to preserve our emotional investment in these people’s after-lives. And once more that even includes Michael, who went from being a sympathetic victim of Eleanor’s supposed deception, to a mocking trickster villain, to again being someone we care for—just a demon who’s trying his best while slowly working his way toward redemption. Or is he? That’s the question that The Good Place is stuck with now by dint of its own cleverness, creating a low-key, persistent echo of doubt that prevents us from ever fully investing in Michael’s journey, lest we be fooled again. The fact that Danson is doing career-best work as Michael—pulling off a performance that’s both charismatic and enigmatic, and somehow capable of actually willing a mischievous twinkle into his eyes—doesn’t help. We’ve been trained by now to just wait for the other shoe to drop and for Danson’s affable grin to shift to just this side of maniacal, revealing we’ve all been played again. This season, we’ve seen a few convincing glimmers that Michael has really changed; his refusal to reboot Janet (D’Arcy Carden) “because… friends!” went a long way toward contending that Michael at least has the capacity to care. But as last night’s midseason finale demonstrated, that doubt nevertheless persists: Michael’s closing conversation with Eleanor about their mutual struggles with self-betterment definitely sounded like the sort of sincere, unguarded talk that two people (or whatever) fumbling their way toward friendship might have. And superficially, Michael’s whistling, bowtie-loosening stroll back to his office would suggest that this had relieved of some of his burden, and that he’s even slowly coming to appreciate these humans for whom he once created an entire universe in which to torture them. And yet, because we’ve all been swindled before, beneath it all is the nagging suspicion that the façade will drop again—maybe even the very second the show returns from its football-imposed hiatus, with Michael telling Shawn (Marc Evan Jackson) that his plan to infiltrate the group got him everything he needed. Narratively, it would be another big twist, but it would also be an obvious one. Perhaps the one article of faith viewers can place in Schur and the rest of his writers is that they’re much smarter than that. Nevertheless, the fact that we’ll spend the intervening weeks weighing the possibility is indicative of the low-grade paranoia The Good Place has sparked with that first big rug-pull, creating the kind of inability to invest too deeply in anything we’re seeing. And unfortunately, that can prove exhausting after a while. Look no further than The Good Place’s chief inspiration Lost, whose myriad twists and reveals became something like a parlor game to solve—inevitably disappointing some when it insisted that the real “solution” was the friends we made along the way. If The Good Place similarly continues to toy with the viewer’s trust, it’ll still be funny, sure. But it runs the risk of losing the emotional connection that makes it so much more than just a zany jigsaw puzzle. To Schur’s credit, he seems aware that the Big Twist is a one-time-only trick: He’s acknowledged that pulling another one is “the least shocking thing you could do,” and pledged there’s not going to be some sort of “double switchback reversal” that goes to the same well again. That said, he’s also expressed the need to honor those fans who love The Good Place specifically because of its twisty nature, saying it’s in “the DNA of the show.” Of Michael specifically, he’s maintained a similar ambiguity: “He doesn’t want to be [in The Good Place], it’s just the only place he can go where he won’t be eliminated from the universe,” he told TV Guide. “So at the moment he says that, yeah, he’s telling the truth.” We’re left to infer that Michael’s “redemption” is likely only a temporary means to a selfish end, always subject to being totally scrapped—along with whatever investment we’ve made in it or his character. So no, we can’t trust Michael (either one of them) and “at the moment,” we can’t trust The Good Place. Right now it’s all a wild, Santa-splattering trolley ride, wherein the show could switch tracks whenever it pleases, and there is a lot of fun to be had in that. But at a certain point, you want to get off the trolley; like Chidi, you just want to know if you’re being tortured. Reassuringly, Schur thinks more than most showrunners about and of his audience—about their jadedness that comes from being so well-versed in the vast history of TV’s narrative turns, and about trying at all times to avoid boring them. He’s always talked about mapping out the show with an overarching plan, and that sort of expectation-defying, forward momentum in mind. So hopefully part of his plan involves clearly establishing, and soon, which side of the moral divide he wants Michael to be on, before that mistrust calcifies into its own kind of jadedness. That would be the best twist of all.